Der Artikel The Nice: Live Sweden '67 (180g) (Limited-Numbered-Edition) (Marbled Yellow Vinyl) wurde in den Warenkorb gelegt. 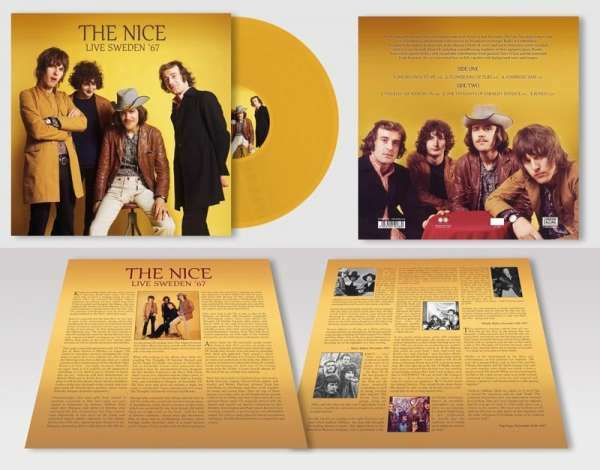 Fresh from a British tour with Jimi Hendrix and Pink Floyd, in mid-December 1967 the Nice paid a short visit to Scandinavia, and performed this session for broadcast on Sveriges Radio in Gothenburg. It captures the quartet at their early peak, playing a blend of covers and tracks from their newly recorded (and not yet released) debut LP, including a mindblowing rendition of their signature piece, »Rondo«. Preserved in superb fidelity, with remarkable contributions from guitarist Davy O'List and the inimitable Keith Emerson, the set is presented here in full, together with background notes and images.